Committed to preserving the history of the MINNESOTA NORTH STARS, National Hockey League franchise from 1967 to 1993. Sandy Fitzpatrick played in 18 regular season games and twelve playoff games for the Minnesota North Stars in their inaugural season of 1967-68. He was a big time scorer in Juniors, exploding for 51 goals and 55 assists while with the Kitchener Rangers in 1964-65. He made his pro debut with the New York Rangers later that season, getting into four games. The following year, he played in St. Paul for the short-lived Minnesota Rangers of the CPHL. 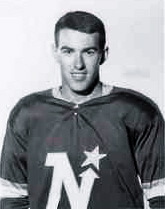 The North Stars claimed Fitzpatrick from New York in the 1967 Expansion Draft. He started the year with the Memphis South Stars, and was called up to Minnesota in January following the tragic death of his former roommate Bill Masterton. Fitzpatrick joined the San Diego Gulls of the WHL in 1969 and has been in that beautiful city ever since. I spoke with him in January about his time in the North Stars organization and his life in hockey. North Stars Preservation Society (NSPS): Hi, Sandy. Thanks for taking a few minutes to talk about your career. You played on the very first North Stars team. What was that like? Sandy Fitzpatrick (SF): I was actually called up after (Bill) Masterton's death. I was in Memphis to start the season and I got called up in January of '68, after Billy died. He was my roommate at training camp, coincidentally. SF: Yeah, we were up at Wren Blair's camp in Haliburton. He took the team up there, where he had his summer hockey camp. They had these little cabins there, and we shared a cabin. So I got to know him a little bit there. NSPS: The other day (January 15) was just the anniversary of his passing. NSPS: That must have been strange for you, coming into replace him after that. SF: They called up another guy from Phoenix... oh man, I can't think of his name! He got called up also. I'm not sure if he went back, but I finished the season in the playoffs that year. It was interesting, I got up there and, in maybe the first game I was there, we played Boston. That was when Dave Balon took all of his equipment off after the first period after a big argument on the bench with Wren Blair. I've never seen anything like it. He just got up and left. I'm like, "What? He can't do that!" I guess Wren had been on his back because he put a helmet on after Billy's death. Blair used to rag on guys like André Boudrias, too, about wearing helmets. I know he'd said something to Masterton, too, because I asked (Masterton) about this helmet thing because I knew he had worn one in college. He said no, he wasn't going to wear one. When I asked him why, he said Wren Blair had told him that hockey's a glamour sport. I never forgot that comment. So, Balon, he hadn't made a mistake. We were on a power play and the puck was in our zone. He caught a pass that was behind him and it was impossible for him to receive it out of his skates. And I think it was Skip Krake who stole the puck and walked in and scored a short-handed goal against us. Balon gets back to the bench and Blair was all over him. I'm thinking, "Man, it was an impossible pass for him to receive. What's going on?" Then I found out there had been this ongoing thing about the helmet. Anyway, Dave just went to the dressing room, took his stuff off, and went home. SF: And we were leaving on a trip the next day. So at the end of the game, Blair had a meeting with Parker MacDonald and Bob Woytowich that was basically, "Hey, make sure Davey gets on the plane tomorrow morning." And he did make the trip. We went to Philadelphia and maybe Detroit on that trip. But Dave Balon did make the trip and they patched it up somehow. Anyway, that was my introduction to the North Stars. NSPS: That's a great story. SF: Blair was an interesting guy. As you may have heard from other players already. NSPS: He just passed away, too, a couple of weeks ago. SF: Oh really? You know, I hadn't heard that. NSPS: It was pretty minor news here. I would have expected it to be a bigger story. SF: Well, in California, hockey is minor news. We don't get much, so I hadn't seen that. I do go on TSN.ca to get a lot of my hockey stuff, but I must have missed that somehow. NSPS: I was actually hipped to it through our Facebook page. Another fan posted the news to the page, so I confirmed and re-posted, and I think we got word out before any of the local media. SF: My sister and brother-in-law gave me (Blair's) book a while ago. It was a long time before I bothered to look at it. I was just never a fan of his. The way I was treated there the next year at training camp... basically I was gone already and I didn't know it. He signed all of the guys from the Canadian National Team. A lot of teams wanted those guys and Blair went after them. It was a real feather in his cap to get all those guys. They signed them all at once. Marshall Johnston, Kenny Broderick the goaltender, Barry MacKenzie... and Danny O'Shea. And that was my job, right there. My job was gone. When I was with the Kitchener Rangers, Danny was playing for Blair in Oshawa, so he was a favorite of his. I always thought I was a better hockey player than Danny O'Shea, but anyway, he signed O'Shea. When I got to training camp, we were told the night before at the hotel, "All you guys from last year, just go to your locker. You'll see your number and all of your stuff will be there." So I went to number seven, and there's two pairs of skates there. So I asked John Mariucci, "Hey, Maroosh, what's going on? There's a couple of pairs of skates here and they're not my skates." And he looks at his little roster list and says, "Oh, that's Danny O'Shea's spot." And I said, "Okay... so what dressing room am I supposed to be in?" So then he flipped a few pages and I'm going, "Uh oh." All summer I had worked. I was so keen on trying to stay with the team. I was going to school in the offseason and I had about a month off before I had to go to Minnesota, so I went to Lloyd Percival's Fitness Institute. He was the guru in Canada. So I went to camp in really good shape. I mean, I was really ready to go. But mentally, I was just knocked for a loop when that happened to me. So in camp I was always on the B team. I got in one exhibition game against Montreal, right near the end of camp, right before we broke for Minneapolis. I had a few shifts in that game and that was it. Then they told me I was going to Memphis. I asked for a meeting with Wren after that. That changed my attitude for the rest of my hockey career, right there. I walked in and he pushed back from his chair, folded his arms... I can't recall whether he put his feet up or not... and he just said, "What's the problem, Sandy?" I was shocked. I left that meeting with a different attitude, for sure. I figured my career was over. Because in the NHL, expansion had just happened. You didn't know when it was going to happen again, so I figured if I can't get a job in the NHL now that there's twelve teams, maybe I should just finish school. So I had a pretty bad attitude going to Memphis and then (John) Muckler made me a captain down there. And I had to deal with him, who I didn't have a lot of respect for, I must say. NSPS: Why didn't you have respect for Muckler? SF: He was a bit of a "yes man," I thought, to Wren Blair. But then, that's what Wren demanded of everybody, I guess. With all those guys who were working for him, he wanted total control. Even with the players, we weren't allowed to talk to the press or anything. Everything had to go through Wren. So I had to deal with John in Memphis. And it was a bit of a revolving door there, too, with the players and even the coaches. I mean, Milan Marcetta was sent down there and told to be a coach, or player-coach. Parker MacDonald was sent down with us. So it wasn't a great year for me. And Muckler got real upset with me at the end of the season. He found out that in the spring semester I took two classes at Memphis State University. I took two English literature classes. I was transferring credits back to Wilfrid Laurier in Waterloo, Canada, where I eventually graduated. They were Tuesday/Thursday classes, and we never had games on Tuesday and Thursday. It never affected my hockey at all. It worked pretty well, but I didn't say anything to anybody until the end of the season. A couple of the guys knew and somehow the secretary in the office knew. When I went in to pick up my last check she said, "John is really upset with you." For the last few months of that season, I had a really good record. I was always a slow starter, for whatever reason. But I finished up really strong, scoring and so on. But his comment to her when he found out I was taking classes was, "No wonder he was playing so bad." That was just the attitude they had. Even when I was signing my first contract, you know, we didn't have any agents. And I asked Wren Blair if they would give me the same $500 in the summer if I had evidence I went to summer school, because the Rangers had been giving me that, and he just about hit the ceiling. He said, "No way. We're not running a school here, we're running a hockey team." There was just no way he was going to put that in my contract. And I remember there was a young kid there -- a couple years younger than me, anyway -- Barrie Meissner. I ran into him later and he told me he got the same routine. He asked about getting some kind of bonus to pay for school. It wasn't very popular with them at the time. And certainly at that time, a lot of guys weren't trying to go on to college. If they were, they probably went to the U.S. already on a scholarship. But if you were in major Junior at the time, guys were just pretty much going to be hockey players and that's all there is to it. So, as a result, at they end of that year, I told Muckler I wasn't coming back. They were moving that team to Waterloo, Iowa after the season. It was a bad year for that team (in Memphis). We did real poorly. Everything just seemed to be unsettled. There wasn't any real direction. And I decided I was going to go back and finish school. Then they made a deal with San Diego during the summer, during the draft. Outside of the NHL, man, the Western League was the best. The American League was all bus trips. The Western League was just as good of hockey, but it was all air travel, good hotels, it was just the place to be. And I knew some guys out here already. So it all worked out for the best. It got me to San Diego! NSPS: And you're still there! SF: Oh yeah, definitely. That's what I mean. It all worked out great. I played a couple of years here. Then I ran into some of the same type of garbage in my third year with the Gulls. Max McNab was the manager/coach. Having been a Detroit Red Wings player, he always had a connection with Detroit and they would send him players on loan sometimes. That particular season they put a limit on the roster size in the Western League, just to save money obviously. They said if a guy's not injured and not in the lineup, you can't have him around. You can't pay those guys, you have to move them or something. Earlier during the season there had been a couple of times where someone from Detroit was coming down, so they sent guys off to Fort Worth, which was a Central League farm club for Detroit. In January, word was Detroit was sending a center down. I wasn't having a spectacular year by any means, and we had a couple of pretty good centers here. Dunc McCallum was our captain here at the time. Dunc said to me at practice, "Hey, Fitz, you better take a dive or come up with an injury here." He was kind of joking and I didn't pay much attention to it. I wasn't going to lay down and say I hurt myself. So, sure enough, I get a phone call at home and Max says, "You're not going to be making the trip. You're going to either Norfolk or Fort Worth." And I knew who the general manager/coach was in Fort Worth and that guy was a total idiot. So I told him, "I don't think so." He said, "What do you mean, you don't think so?" I said, "I'm not inclined to go. I think I'm just going to pack it in." He said, "Well, you know, you'll be suspended?" I said, "So, suspend me." I got on the phone and I called a guy I had met a couple of years earlier, who was a Gulls season ticket holder and had a mortgage lending business. We had gotten to know each other pretty well over the last couple of years, and I had my green card and my real estate license, so I could go into business right away. I called him and he said, "Come in tomorrow morning." And that was it. I found out a couple years later that (Phoenix Roadrunners coach) Sandy Hucul tried to get me and McNab told him I had retired. I would have gone to Phoenix. I would have stayed in the Western League, but I wasn't going to go to the Central League. So I packed it in, right there. (San Diego) sent me a contract for the next year. Sizable raise! Of course, the WHA was starting. Best raise I ever got. I negotiated with them a little bit, but still wasn't quite what I wanted and I said, "If I don't get exactly what I want, I'm not going to do it." I was very close, but decided I'm not going to sign. I was stubborn, they were stubborn. That second year (out of hockey), I went through withdrawal. That was really hard. I wanted to play. And the WHA came to San Diego. The Western League ended up folding. Of course they lost teams to the NHL, like Vancouver. The WHA came in and we got the New York Raiders, who moved to San Diego as the Mariners, and the Western League was gone within a couple of years. I contemplated playing with them, but I got through it. I was 27 when I quit, and I'm sure I had some more years in me, but the mortgage business turned out to be pretty good for me right away. I mean, I was certainly making more money by the end of that first year than I was going to be paid to play hockey. At some point in time, you have to make that decision. I figured my chanced of getting back to the NHL were pretty slim to none. Being out in San Diego, I just stayed and went into the mortgage business. NSPS: I'd say that's worked out well for you. SF: Yeah, you can't play forever. I'm still passionate about hockey, and I've often thought I could have gone somewhere and taken a job as an assistant coach in junior hockey, or even in pro hockey. But, again, it's worked out for the best, being able to live in San Diego. I really miss having hockey here, though. We had the IHL team (San Diego Gulls) here in the early nineties -- good hockey! I was doing radio and TV color commentary for them when they were here. I did some with the Mariners, too, but with the IHL Gulls, I did a lot of stuff with them. I enjoyed that. NSPS: Are you still involved in hockey? SF: I started coaching the year after I quit playing. I started as a youth hockey coach. My oldest son was playing by then. And I'm still coaching youth hockey. I got a little burned out last year. By the end of the year I was feeling burned out and I said, "I've got to take a break." I did take a break previously, too. Between my oldest son and my second son playing, I took a year or two off. So this year, I'm just helping out another coach with a real young team. Nine and ten year olds. My grandson started, too. He's six. He's playing mighty mites. So I've been working with him the last couple of years, just getting him on the ice and getting him skating, and now he's on a team. I've stayed in hockey and I've certainly followed it all these years. NSPS: Your second year with the Kitchener Rangers, you had a great year with over 100 points. SF: It was a super year. We had a good combination. Our forward line was really good. We missed the playoffs by one win. But we had a great line. We were going up against a line from Peterborough with André Lacroix, Danny Grant, and Leo Thiffault. I finished tied for third in scoring that year. Lacroix was second and number one was Ken Hodge. Lacroix was centering that line in Peterborough and we were battling it out for the highest scoring forward line in the league. That was a fun season, except it was really disappointing to not make the playoffs. It was kind of unfair, too, because we lost to St. Catharines, who beat us in their rink. In the last couple of weeks of the season we were down there for a game and our bus got hit right in downtown St. Catharines. I think our bus driver ran a red light and we got hit broadside. We were all kind of shaken up. We got off the bus and many of us walked across the street to see the car that hit us and the guy in there was really a bloody mess. So we're in the dressing room before the game and Billy Hway, who was one of my wingers, had to borrow a pair of skates because his were covered in battery acid from being in the bottom of the bus with our equipment. A lot of guys had damaged equipment. And in the dressing room before the game, I was trying to get the guys fired up, but everyone was just sitting and staring, you know? Our minds were not on hockey. We lost the game, of course, and that game cost us the playoffs. But I keep in touch with the Kitchener Rangers people pretty closely. I've been up there a few times. NSPS: And the year after that, you actually played here in Minnesota for the Minnesota Rangers. SF: Yeah. Fred Shero was the coach. And he coached us the next year, too, when the team moved to Omaha. But the Minnesota Rangers were called the St. Paul Rangers the year before and they went bankrupt or something and changed the name of the team. It was basically the New York Rangers who were providing all the players, as they always used to do for the Central League teams. Best coach I ever had was Fred Shero, those two years. Things went pretty well that first year. We had Larry Mickey and George Konik, who was a part time player. I think George was working for 3M at the time. I remember that first year in Minnesota, Konik did sign but he had some kind of agreement that he was going to stay working for the company, so we missed him a few times. But still, we had a pretty good forward line and I thought we did pretty well in the playoffs. The next year the team moved to Omaha and I broke my hand in January in a fight with Skip Krake, coincidentally, who was the guy in that other story. I was out of the lineup a while, then they had to reset my hand, so I was out even longer. And I was really sweatin' it. That was the year before expansion and everyone wanted to have a good year so they'd get drafted. But I had Fred Shero again and my coaching style would certainly follow his. I thought he was a great coach. He just had a way with guys. I've never seen a team where the players, and especially the captains, really kind of ran the team in a lot of ways. Just the way he worked with those guys, he had great success. He was able to get the best out of players. And most of it had to do with the players themselves. They just wanted to do well for him. He wasn't a yeller and screamer by any means, but guys wanted to play for him. So I enjoyed that year there. NSPS: Where did the Minnesota Rangers play? SF: They played in St. Paul, in the old St. Paul Auditorium. It had a wire fence, like most rinks at that time did, I guess. NSPS: When you came back with the North Stars to play in the Met Center, it a brand new building at the time. What do you remember about how fans embraced the team that first year? SF: Yeah, it was exciting in there. We had very good fan support. NSPS: Do you stay in touch with any of the guys who you played with here in Minnesota? SF: No. Billy Collins for a little while. I remember one summer I went to visit him up in Ottawa, but that's about it. Billy Taylor, who I played with in Memphis, I had also played with in Juniors for a couple of years. I stayed in touch with him for a couple of years, but he died young of a heart attack. I played with all three Plager brothers. I played with Bobby Plager my first two years in Juniors, in Guelph. He was two years older than me so he didn't go to Kitchener when the team moved over there. I played with him with the Minnesota Rangers, too. Then I played with Barclay Plager with the Omaha Knights when the Rangers moved over there. 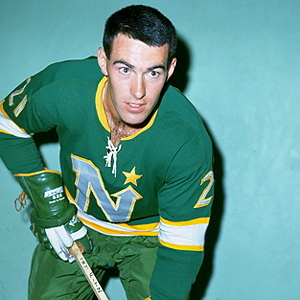 And then Billy Plager with the North Stars. I ran into Bobby when he was out here with Peoria of the IHL, working for St. Louis. I met him a couple of times. NSPS: Well it's been fun talking to you. For a team that's been gone for twenty years, there are still a lot of hockey fans here who miss the North Stars. SF: Yeah, it's different, I'm sure. I think when you're young you develop these connections with a team and when it all changes just like that it's not the same. But you get a lot of good hockey there. I love hockey, you know, and my second favorite sport is soccer. And here I am in San Diego and we have neither! NSPS: What do you do? NSPS: Sure. He was our GM. SF: Yeah. And he's the assistant GM here in L.A. In fact, I just did his home loan a few months ago. Every now and then I'll give him a call and he'll hook me up with tickets. The problem there is that they start later. They start at 7:30, so by the time you drive back home it's pretty late. Anaheim starts at 7:00 and they're only eighty miles away, so I can be home in about an hour or maybe an hour and ten minutes on the freeway. So I'm more inclined to go there, I can actually be home at a reasonable time. But I just go to a few games. I've got enough involvement here with the youth hockey stuff.